With over 36 years of concrete cutting and concrete demolition experience, A&A Concrete Sawing and Drilling, Inc are Louisville’s concrete experts. Over the years, we have built trust and an exceptional reputation with our satisfied customers as being a reliable, customer service oriented concrete contractor that provides advanced and economical solutions to all concrete needs. We offer a wide range of concrete services to meet any of our clients needs, including concrete grinding, concrete wall and hand sawing, core drilling, flat concrete sawing, slab sawing, electric slab sawing, wire sawing and concrete demolition services. For decades, our company has been building quality relationships with local contractors by providing the highest standard of work, honesty and integrity through all our projects. If you are looking for a dependable concrete contractor, contact our professional team to get an free estimate for your concrete project. 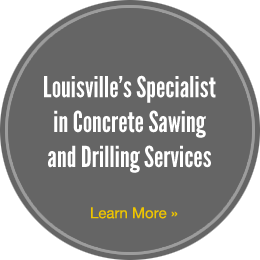 As Louisville, Kentucky’s full service, family owned and operated concrete specialists, A&A Concrete Sawing and Drilling is an expert concrete contractor company with over 36 years of professional experience in the industry. We specialize in top of the line concrete cutting service, including flat concrete sawing, core drilling, wall and hand sawing, slab sawing, concrete grinding, demolition services and much more.